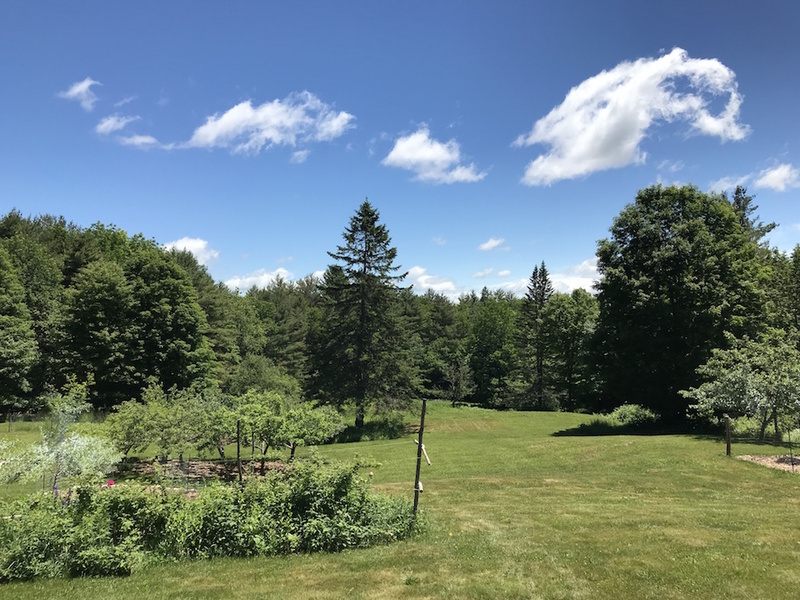 Yeah, yeah, it’s August and I’m just now getting around to writing about June on the homestead… if you’re wondering why, read this. It’s rare that I say these words, but, we were feeling hot, hot, hot in June. We are not hot weather people (I repeat NOT), as evidenced by our move to a snowy state. Summers here are usually temperate and quite manageable with opened windows and doors (screened, of course). But June wrought a novel form of heat, unfamiliar to our winterized bones and we boiled like so many lobsters in a pot. Thankfully, this punishing heat lifted and we’ve returned to the 70s and 80s of our acclimation. Despite our human hatred of heat, our tomatoes and hot peppers felt differently and grew to unusual sizes. One of our tomato plants is nearly taller than its trellis and summer is barely half over! June was bonanza month for veggie garden growth and, so as not to impede things, I sat back and watched Mr. Frugalwoods scurry around weeding. Which brings me to a highlight for many of you who’ve oh so patiently waited for an update on our FLAME WEEDER (this is an affiliate link). The FLAME WEEDER–as it is known–does its namesake well: it weeds via flame. When Mr. FW first proposed that we buy one of these, I waved him off thinking, I don’t have time for your jests, buddy. But he persisted and finally convinced me that it is a real thing–an actual, factual gardening implement. What’s more, it is apparently one of the most efficacious ways to manage a garden organically. Since we want to grow our fruits and veg organically and don’t want to dump pesticides on them, weeds are an ever-present interloper, particularly in the veggie garden. Enter: the FLAME WEEDER. The reason for flame weeding versus cultivating (scraping the ground to remove weeds) is that when you cultivate, additional weed seeds can be disturbed and germinate. The flame weeder, on the other hand, doesn’t disturb the surface of the soil and so shouldn’t introduce new weeds into the mix. 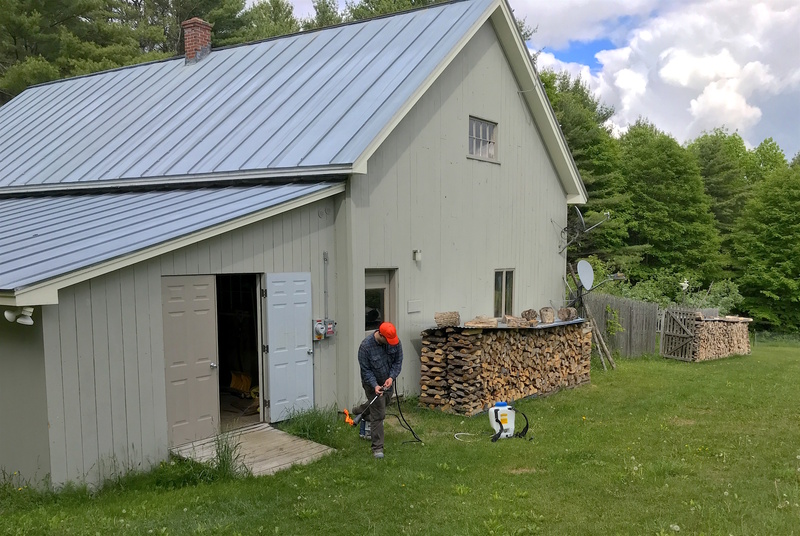 The flame weeder is also a multi-purpose tool: in the future we can use it to light brush piles on fire and Mr. FW has already used it to heat up a stubborn bolt on the tractor box blade in order to remove it. In Mr. FW’s words, it’s nice to have a large propane torch at your disposal. First, the FW was employed to scorch the earth prior to planting. 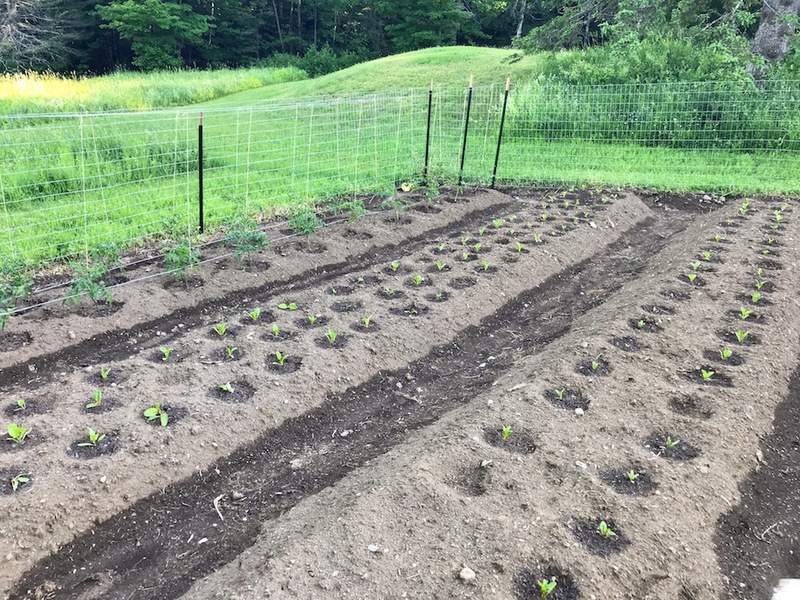 After Mr. FW dug out the rows to create our new (and larger) vegetable garden beds this year, he allowed the weeds to germinate and sprout. He taunted those weeds, letting them grow unchecked and with abandon for several days. Then, when we sensed the time was right, he unleashed a firestorm of terror upon their weedy heads. It sounds more dramatic than it actually is as the flame itself is pretty controlled and does not (much to my disappointment as a photographer) look all that spectacular. It’s just sort of a little puff of flame that incinerates the weeds on contact. The flame weeder is particularly useful when you’re direct seeding because you can time the germination and flame weed AFTER you plant seeds but BEFORE your veggies pop out of the ground, which gives your veggies a big head start on the weeds. A major problem otherwise is that the veggies and the weeds pop up at the same time and, uh, look a lot alike and make it tough to weed around your fledging plants…. this is what happened to us last year and more than a few vegetables were accidentally weeded… whoops. Next, the flame weeder took care of the weeds that usurp the walking paths in between each veggie row. 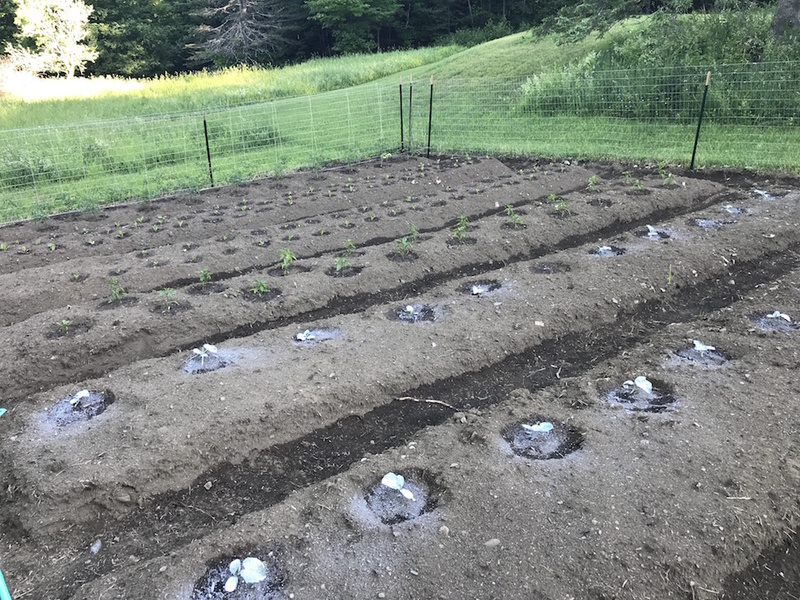 Powdered by propane, Mr. FW was delighted to learn that the flame weeder uses very little as he was able to flame weed twice on the seed beds and three times between the rows and hasn’t had to replace the propane tank yet. 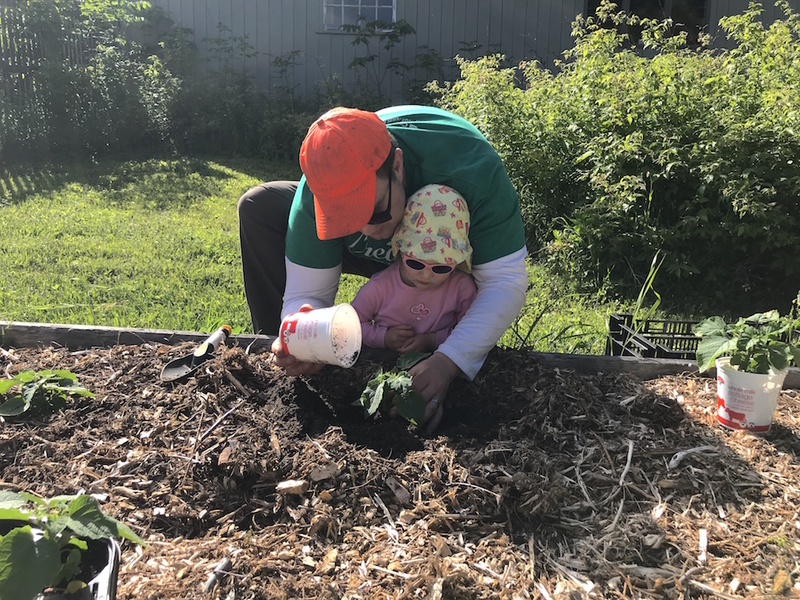 If you’re curious about how we manage weeds around our perennial fruit trees, the answer is sheet mulching and you can read all about that process here. June represents a wait, tend, weed, and hope cycle for the garden. It’s too late to plant anything new, but too early to harvest. So mostly we wait, we weed, and occasionally we water. Thankfully we get a fair amount of rain, so watering is an infrequent event and by early June, the entire garden was planted. Cherry tomatoes! Mr. FW possibly went overboard with cherry tomatoes this year (I say this with all love and honesty) due to a garden pest we encountered last year that wasn’t accounted for in any of the gardening books we consulted: our toddler. Caught unawares by this voracious critter, last year’s tomato crop fell prey to her munching jaws. Babywoods would run through the tomato rows and pluck and eat every single ripe tomato (and plenty of unripe specimens as well). I estimate that Mr. FW and I each feasted on one tomato the entire summer. 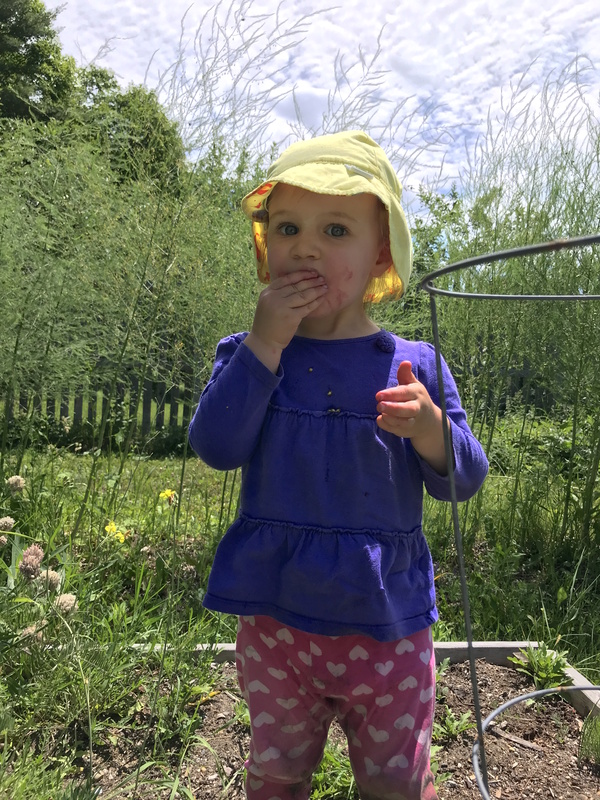 In deference to this little beast’s tomato-crazed appetite, the man planted no less than 36 cherry tomato plants (versus SIX last year) of the following varieties: Gold Nugget and Matt’s Wild Cherry. Here’s hoping we get to eat a few more this year. We opted to do all cherry tomatoes versus larger tomatoes as we think the flavor is better and the larger tomatoes have trouble ripening in our growing season. So far, the Gold Nugget variety seems to be producing better than the Matt’s Wild Cherry. Rainbow chard! We adore chard in all its many forms and rainbow chard seems to have a particular affinity for our zone 4 cold climate and brief growing season. Last year, a number of our chard plants perished, so Mr. FW accounted for this loss in his seed starts this year and planted a whopping 80 chard plants (rough estimate–I meant to go out there and count them, but I forgot and now it’s nighttime and I’m drinking wine). Uh, I’ll give you a sneak preview and let you know that, so far, not a single chard plant has perished. In other news, we’ll now be using chard leaves as cleaning rags, paper towels, and I’m fashioning skirts out of the stalks for me and the girls. Kale! 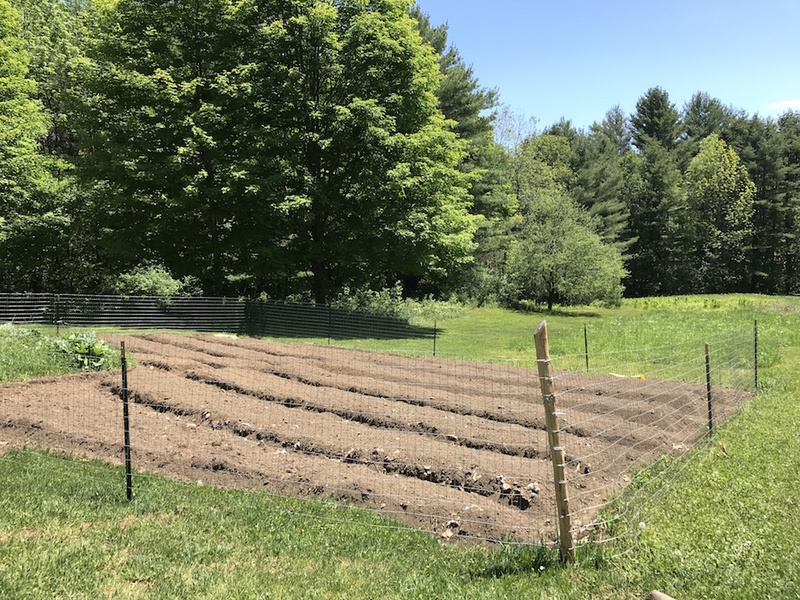 It’s a requirement for former hipsters to plant kale; it’s in the contract we sign with the state of Vermont before we’re allowed to post our gardens on Instagram. It’s a lifestyle thing, you understand. Mr. FW selected a different variety of kale from last year and, unfortunately, it fell victim to a bout of nasty cabbage worms. Ever the vigilant(e) gardener, Mr. FW took note of this malady early on in the kale’s life and treated it with a round of BT (which is an organic bacteria that specifically targets caterpillars and their ilk). At this point all 50(ish) kale plants are still alive, but are struggling to catch up in size to their swarthy chard counterparts. We might need to consider a re-branding here to convert over to chard-sters. Cucumbers! Longtime readers may recall our cucumber-pickling-a-palooza last summer and our ardent love of Mr. FW’s spicy pickle creations. Babywoods and I eat an entire jar in one sitting. Not a long sitting either. In deference to this, Mr. FW ramped cuke planting up to 25 cucumber plants. So far, hale, hearty and producing well. It’ll be pickle time soon my friends. (P.S. if you’re on our Christmas gift list and DON’T like our pickles, speak now or forever hold your jar(s) of pickles.) The variety we planted is aptly called National Pickling, we’re happy with them so far, and they seem to like the climate. Snap peas! We, as a family, are on somewhat thin ice with peas and their relatives Mr. FW planted a gargantuan number of beans and peas last year and we ate a ton of them, but didn’t think they tasted all that superb. He also preserved a bunch of beans which, to be honest, didn’t taste terrific. We ate them, but not with much fervor. So, he’s trying snap peas this year to see if we consume these at a more rapid rate. Thai basil! Mr. FW (our sole household chef) cooks with a lot of Thai and Korean spices, including a not insignificant amount of Thai basil. So why not plant some? I’ll tell you why not: it appears to hate our climate. Last year’s crop of regular basil grew to the immense size of the head of a pin (I am not kidding), so I’m wondering if our environment is hostile to basil. Oh well, at least we have some super cute basil-gone-to-flower in our garden right now. Cilantro! Another favorite herb of my personal chef’s, cilantro is new to our line-up this year. Seems bushy and happy thus far (but how can we know if it is truly “happy,” did anyone ask it? Or are we simply projecting our own wishes upon Cilantro? Forcing it to live out a facade of “everything’s fine” when in secret it seethes, feeling misunderstood and rejected for its desire to start a punk band in Brooklyn and not pine away as a lonesome herb in the Vermont countryside–seen a bucolic by some, but felt as a prison by Cilantro). Hot peppers: cayenne and jalapeño! Another key accompaniment for Mr. FW’s Thai and Korean cooking, hot peppers are delectable. Last year’s didn’t do too hot, but this year Mr. FW planted more and they appear (at first blush) to be motoring along with aplomb. At early analysis, the cayennes seem to be doing much better than the jalapeño. We had a tough go of it with out hot peppers last summer too, so we might need to re-think this strategy for next summer. This is our third year of gardening and, as you can see, it’s a trial and error sort of process. We’re guided primarily by the pillars of: 1) what will grow in our climate? ; 2) what do we like to eat? ; 3) what isn’t as good/as cheap when purchased from the store/farmer’s market? ; 4) what preserves well for winter? Last year, we planted pumpkins and squash and, while the pumpkins were adorable, they tasted awful. Same goes for the squash (although it was lumpy and decidedly less adorable, so really, two strikes against the squash… ). And sure, you could load them up with butter and/or sugar, but that misses the point for us of trying to eat these veggies as healthfully as possible. So this year? No pumpkins, no squash. We’re honing, testing, and seeing what it is that we like to eat and to preserve. While we eat in real time as we harvest, the vast majority of the garden will get canned and preserved for year-round consumption. At least, that’s the goal, which is pretty grandiose considering Mr. FW and I both have other jobs (at least mine is to write about it), two tiny kids (shockingly not helpful in the garden), and have no idea what we’re doing. OTHER THAN THAT, we’re killing it (literally in the case of the Thai basil). 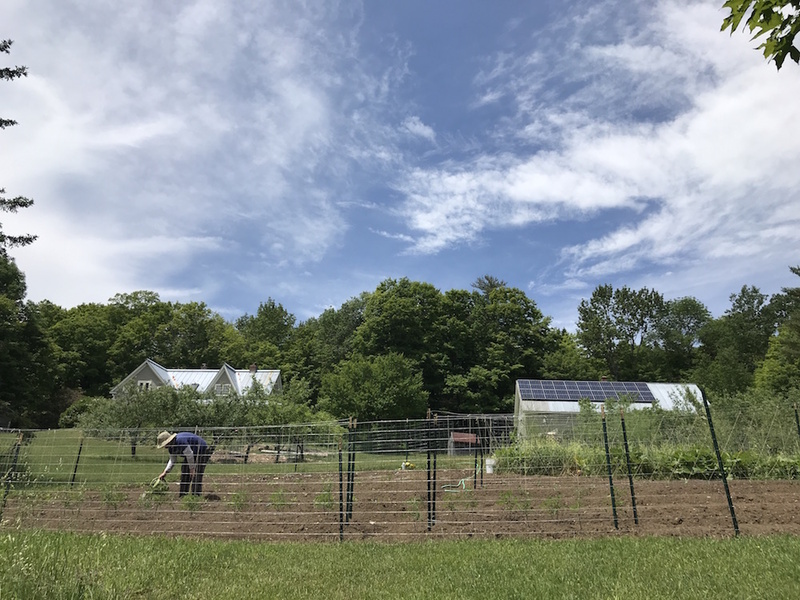 As I waxed at length last month, parallel to our annual veggie garden is our goal to create a permaculture, perennial homestead paradise. We are largely sucking at this, but–thanks to Mr. FW’s heroics (and ridiculous ability to get an inordinate amount of work done in infinitesimal amounts of time)–we made serious progress this spring. He planted four varieties of blueberries, currants, Saskatoons, honey berries, and two varieties of cherry. 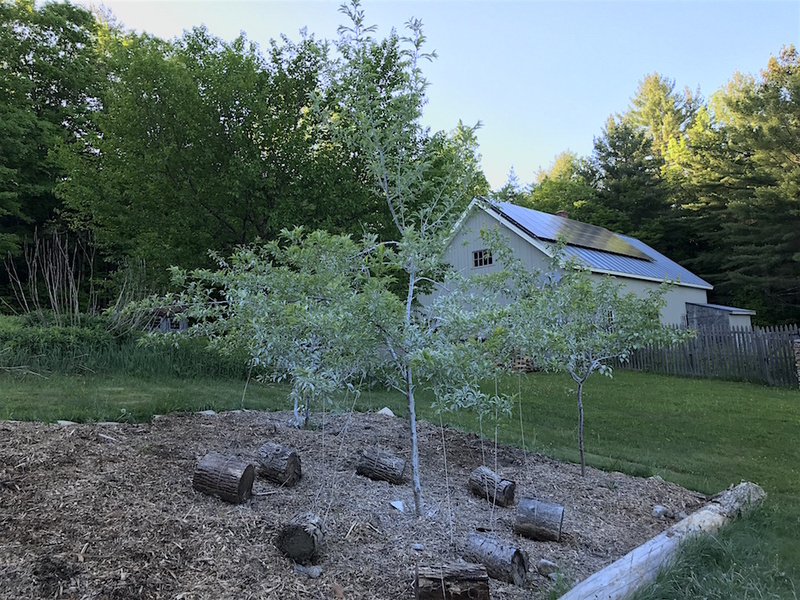 My homestead husband also embarked on a rehabilitation effort (including extensive pruning) of our apple orchard and plum “orchard” (we only have three plum trees left to our name, so I’m not so sure it’s an orchard… “mini orchard”? “morchard”?). In furtherance of these perennials, he embarked on a course of applying clay surround this month. 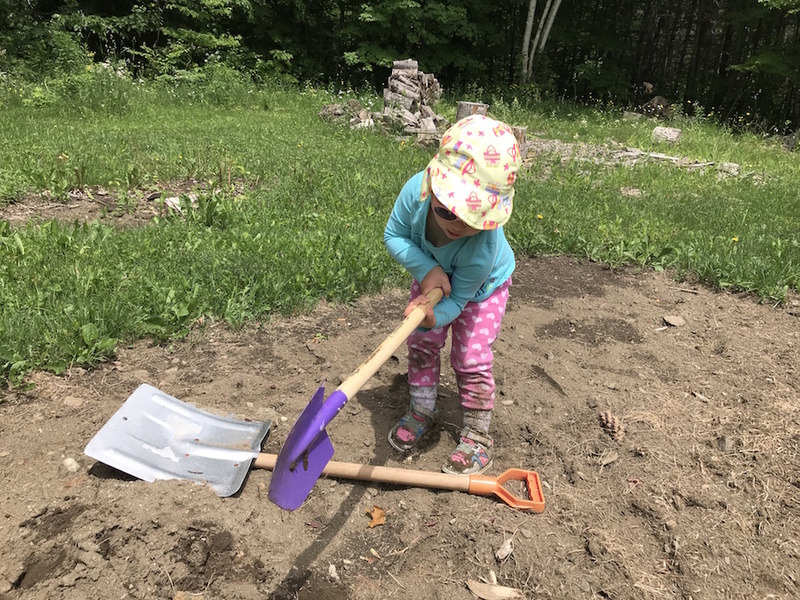 We are (at this point) organic gardeners for a number of reasons: 1) we don’t want to pollute the earth with chemicals; 2) our children see fit to lick/eat everything in sight; 3) it’s cheaper. Given this, Mr. FW was pleased to discover Surround WP, which is a mixture of very fine organic clay particles that’s applied to perennial fruit trees to confuse and deter bugs. He uses this backpack sprayer (this is an affiliate link), which allows him to spray a fine mist of clay onto the leaves and trunks of the perennials. This is a new treatment system for us this year and we’re dearly hoping it’ll reduce the number of insect-related pests. We’re still beta testing whether or not spraying your toddler with clay provides the same deterrent. The downside with using clay as a treatment, as you might’ve guessed, is that, uh, it washes off in the rain. And so, Mr. FW gamely gets back out there after a rainstorm to re-spray each tree. Not exactly time-efficient, but it does keep our orchard organic and–thus far–appears effective at bug mitigation. Surround is purported to repel insects that attack fruit early in the season, so he started spraying right after petal fall when the fruits were tiny. As the season progresses and the fruit grows, he’ll stop spraying the trees as they’ll have outgrown those pests. We’ve also read that Surround can help with Japanese Beetles, so if we seem to have a lot of those this year, he’ll spray again. So far, the report is a thumbs-up for Surround. Looks like we’ll get about three years out of our 25 pound bag. Summer equals visitors to the homestead since, for some odd reason, no one wants to visit us in the middle of winter. Must be all those ice storm chic photos I post… will have to reconsider my snow documentation methods. We love having friends and family visit us since sharing our homestead brings us immense joy (plus we try to con people into doing yard labor for us). Notice how almost every action item above is preceded by the words “Mr. 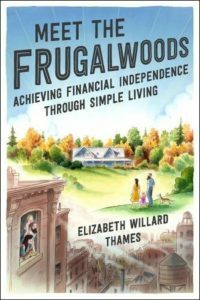 Frugalwoods”? Wondering what I did all month? Slake your curiosity right here. Onward to July, frugal comrades! How was June on your own personal homestead? Mr. FAF has been planting some seeds and roots in our backyard. He suddenly became interested in gardening, which makes me really happy since (1) we can save a bit of money that way and (2) I just like harvesting the fruit of his labor hehe. Summer has been pretty temperate in DC this summer. It’s hit 90s a couple of days, but most of the time the temperature stays below 90, which is awesome! Ground cherry, is that the American name for physalis? Also called chinese gooseberry (I think because the husks look like Chinese lanterns). If so, they’re lovely but usually expensive to buy. You don’t go in for a lot of faff, but with the husks open they work really well as decoration on a cake or platter. You can paint the husks gold (with edible paint) and they look beautiful. That’s a great idea about painting the husks – must try that. Here in new Zealand they are called Cape Gooseberries. The plant grows to a rambling waist high. I think you either love them or hate them. In Australia they are also called cape gooseberries. Chinese gooseberries, on the other hand, are now popularly known as kiwi fruit, but are actually native to China. Be forewarned – they spread like no tomorrow. But as Julie says, delicious AND pretty much grow in “individual” servings. The ones we grew as well as the ones we bought from a farmer’s market did have edible skin. Ones purchased at a grocery store had skin that was one the tough side. Another good choice to eat (I’ve not grown them) are Kabocha. We decided to experiment with zucchini this year, and we have now become those people who try to get you to take the extras at work and family gatherings. The most unfortunate thing is that, since I’m pregnant, my body has decided to revert to being a picky 10 year old, and I can’t eat most of the things we’re growing! I’ve been hiding as much zucchini as I can in bread, but unfortunately some of the garden and our CSA food is languishing. I need to find better preservation methods until I can (hopefully!) eat them again. Oh man, gotta love pregnancy cravings/aversions!! We are liking the Gold Nugget variety best so far. And, we just tend to eat the cherry tomatoes straight (or with a touch of salt–if they make it that far!). You can also put grated zucchini in chili or spaghetti sauce. Or dice up and fry with potatoes. Also good added to cucumber salad. Add some fresh blueberries or strawberries to your zucchini bread. You won’t be disappointed. My favorite way to use zucchini is in an “apple” crisp. My recipe calls for 8 cups of cubed zucchini, I usually add one apple just for a little extra flavor. For cherry tomatoes I roast them in the oven with a little olive oil, basil, salt and pepper, then add garlic at the very end. Pintrest has lots of recipes and the tomatoes taste AMAZING this way. I have added these roasted tomatoes to lots of recipes and plan on freezing them. Thanks for sharing your veg growing stories. It’s baking hot here in the UK too and hard to keep up with the watering but all the veg seems to be thriving. Isn’t chard great – looks pretty, is largely pest resistant and tastes good. It can also struggle through cold weather until the spring (although a Vermont winter might see it off). Thanks again for your entertaining, informative posts. Your recounting of the tomato cherry pest that stalked your garden last year had me rolling on the floor! It’s amazing what toddlers can devour. Just the other day our 15-month-old put away no less than four(!!) slices of watermelon, and would have kept going if we would have let him. Looking at his small frame surrounded by the gnawed remnants of his feast, I wasn’t quite sure how he managed it. The Surround WP clay spray sounds interesting. Might have to look into that myself, as beyond dormant oil we’re not using any organic sprays at all currently. This is the first year our orchard of 18 dwarf fruit trees is bearing fruit, and we wanted to see how it fared regarding pests before beginning a minimalist spray regimen. Some of the apples are untouched (Fuji), while others have been hit rather hard with pests (Golden Delicious), so I need to put a plan of attack together for next year. Does Surround WP also deter animal pests like deer, raccoons, squirrels, or birds? If so, this might be an effective deterrent for us. Our orchard receives visits from all of the above. Our underground resistance effort relies primarily on scented dryer sheets at the moment, with occasional night-time stereo use when fruits are in season as well. Surround is for insects only, I haven’t experienced any animal deterrent effects. Our apple trees are large enough that a little deer nibbling isn’t a big deal… and our cherry trees are enclosed in fencing. I sprayed every 7 days, or after more than 0.5 inches of rainfall, for six weeks starting immediately after petal fall. So basically when the apples were pin-head sized to golf ball sized. After that, the major New England pests it can keep away have run their course. We’ll still get plenty of buggy fruit (just the reality of organic orcharding) but early indications are that it made a major difference in apple defects. Have you used the flame weeder on larger weeds, like on an overgrown area of your yard or a neglected garden patch? I am with you on the squash but winter storing butternut is sweet and best also disease and insect resistant. If you are not familiar give it a go at your farmers market. We use our for pies, breads, roasting with with root veg, mashed like potatoes… Ours hold till april in our basement. We tried rainbow chard this year, but it didn’t take. Our backyard gardening is a much smaller operation with a few raised beds so thankfully little weeding, but I bet offering to buy a flame thrower would be a good way to convince my husband to till up our (brown and crispy – we don’t water it) grass lawn. We employ worms to gobble up our food scraps and produce compost. It’s a cheap and environmentally friendly alternative to buying stuff from the store, and our plants seem to love it. Sadly, we live in the PNW so no one blinks when you tell them that you have a worm farm. My Midwestern family gets a kick out of it. It’s a good option for those of us who don’t have the space for a big compost pile. I love your homestead and garden series! I snagged a plot in a city allotment this year (finally!). Halfway through a garden season of weeding, the flame weeder is quite appealing! Not sure how it would be received by other gardeners… I think we’ll try garden fabric next year to block out the weeds first. Have you ever tried that? I also notice you construct ‘sink holes’ around the plants. Does that help and hold up over the season? That didn’t occur to me as I set up the garden in a hurry and retro actively constructed some. Which has been kinda working. I need to rebuild it once or twice a week. Are your ground cherries and basil planted in a spot that had a heavy feeder last year? Aside from legumes, most garden veggies take a lot from the soil and don’t give anything back, so you need to replenish with finished compost or organic fertilizer. 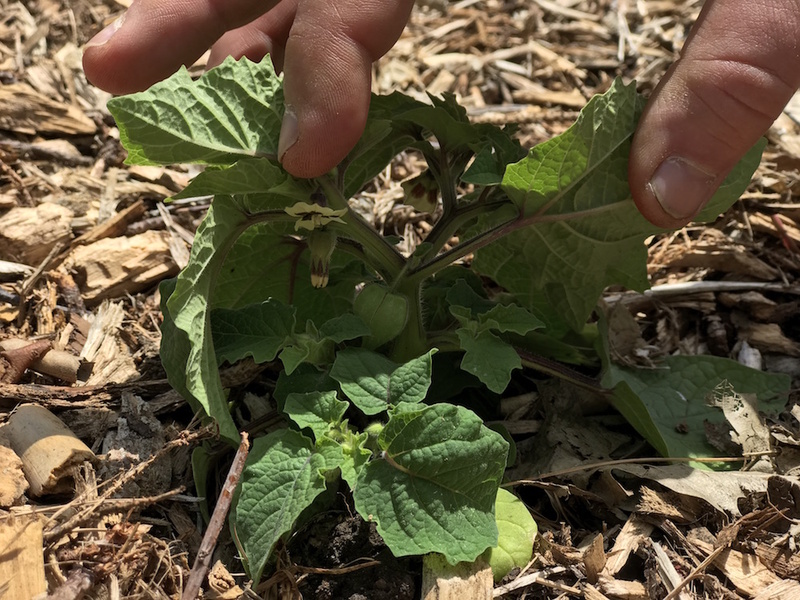 Your ground cherries should be much bigger (and will continue to grow and set fruit until frost). I bet if you gave them some compost they’d spring right up. It’s also not too late to get a batch of basil if you plant it out soon, give it more nitrogen, and keep it pinched back so that it gets bushy and doesn’t bolt. I hope this helps! I’ve been enjoying your blog for years! Totes want/need a flame weeder. My husband is not convinced I need to be wielding fire and taking out weeds. I beg to differ – we have 3 large sections of interlock walkways and the weeds are a pain in my backside! Maybe it will be a bday present! I love Babywoods garden. My parents used to have us plant our own “bunny buffet” in an attempt to get the bunnies to eat something outside of our veggie garden. Ahh, so fun! I love seeing all of the things y’all are growing! I wish our garden were so productive in June. As of the start of August, we’ve gotten a few pounds of okra, a handful of figs, and two tomatoes. However, the green onions are growing like weeds! Your dirge for the cilantro was truly entertaining! Bravo! Basil is picky and loves heat and nutrients. It might do better as a potted herb close to the house so your cooler nights don’t bother it. Plus, they always seem to need some fortification with compost or such. I lived in the mountains of Colorado; it seemed to do better in a pot than in the ground. You might give it a try. I agree with you on basil. They are very intolerant of even mildly cold weather (we live in Texas). I have had the most success with basil in pots kept inside in a sunny windowsill. Two plants in 10 inch pots kept our two-person household us swimming in basil for the entire year. Do you have any tips on how to get large tomatoes to ripen in northern climates? This has been my perpetual challenge gardening in Northern IL. I get large tomatoes in abundance (and cukes too, which are great, though I don’t pickle them, at least not yet) but the tomatoes NEVER turn red, not even the cherry ones. We usually have to eat them green or they rot. We’ve tried the “pick and place in windowsill” that worked for me as a kid in Ohio, but that doesn’t seem to work here. We start our tomatoes from seed indoors in February/March in order to give them a leg up on the growing season. They’d never ripen if we direct sowed the seeds–our season is just too short. OK. Interestingly enough, I also sowed my cherry tomatoes from seed indoors starting in Feb/March, and my large heirloom tomatoes are started from semi-mature plants purchased in preplant pots at the nursery (to address same short season issue), also to get a leg up. And yet, still no red ripening this year! I have followed all the published tips/tricks for Zone 4 and still little ripening. My neighbor two doors down is having same problem this year, and this has not occurred for him in the past. Is it a soil quality and/or sunlight issue, perhaps? Weird!! Hmmm, I do not know enough about tomatoes to know… I hope you can find some answers though! Thanks. If all else fails I can always make fried green tomatoes. We did that one year…. Sounds like a soil deficiency to me. If you use an organic fertilizer of some kind that has too much nitrogen, it won’t encourage the plants to ripen the tomatoes. They need some potassium in the soil to ripen. Also, tomatoes (esp. the less hearty, non-heirloom kinds) are super finicky about temperature. They only ripen when it’s around 75 F, so extended periods of below or above that during the ripening time will cause problems. If you can green salsa you can substitute green tomatoes for tomatillos. The tomatoes will stay a bit firmer but the salsa tastes the same. Between weeds and mosquitos I’m kept very busy this year. Good ‘ole swampy DC…. Wow this is awesome! The garden looks great, hard work really does pay off. I would love to get some land where i can grow my own food one day. I have to get out of NYC first haha. I love this, thanks for sharing! I concur on Elaina’s tip regarding basil. I have grown basil from seed in chilly Northern IL (30 miles from WI border, and our winters are cray-cray, we are in your same growing zone, 4) for many years with success. I grow it in pots on the back deck, close to the house, and start the seeds in our sunroom. I stick to Sweet Basil and Italian Basil, and a neighbor of mine does Lemon Basil. Have not tried Thai Basil, but I do know that most plants native to SE Asia do poorly in Zone 4. So maybe switch to another variety? I don’t see any part of N. IL being zone 4 – zone 5a or 5b. I don’t have problems with tomatoes ripening. I am on the cusp of 5a/5b, I am about 3 miles from the WI border. The make-up of our property (hardwoods) and location provides us with a micro-climate as we call it. With the exception of a short yet intense hail storm, our garden fairs quite well. I am having issues with sweet peppers and suspect soil balance. I’ve had luck in the past. Our basil has exploded over here while our cilantro has basically given up the ghost…wanna switch?! I WAS actually waiting anxiously for the report on the flame thrower, and now that you’ve obliged me, I’m feeling like I can officially call summer a success. The real question is–can you only work that bad boy on a patch that’s entirely weeds? Or is it controlled enough that you can kind of pick them off one by one (providing that your tomato plants are not too large, obviously)? You could use it around existing plants, but not anywhere close to them, if that makes sense. Mr. FW was able to week between the rows when the veggies were super small, but it would be impossible now that they’re larger. Good luck! 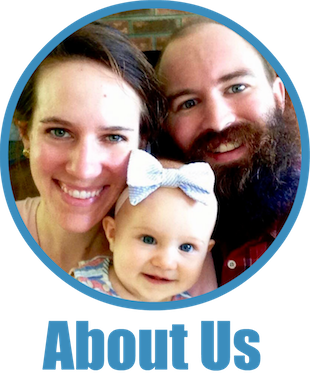 Not finance-related or in tune with your spending report, but as a long-term reader I just wanted to say it’s really, really sweet to see Babywoods grow up over the course of your blog. Cutest little tomato thief one can ask for! I’m in WI, and grow peppers in black pots on my deck. They like to be hot and very well-drained. This works so much better than when I attempted planting them directly in the ground. I just plant my seedlings in the 2 gal size pots from various trees and bushes we’ve purchased over the years and they thrive. After many years and various techniques, I think I’ve given up on trying to grow tomatoes and peppers from seed. Some years are ok but other years the big heirloom tomatoes never/barely ripen. The growing season is simply too short, and it’s turned out to be much less frustrating to buy the plants that my local greenhouse pre-started in March. At $2.49 for a 3-pack it’s still pretty frugal, even if not as cheap as seeds. Swiss Chard: Dry your extra. An inexpensive dryer (I got mine at Costco a couple of years ago) is just fine for this. Save your “good dryer” bucks for the time you get seriously into drying. Just pile it on the treys and dry away. Put your dryer in the garage or on the back deck if you have a plug there. It will keep the heat and humidity out of your house. When dry stuff the dried out leaves (or what is left of them) into a jar and mash it down. You will end up with “leaf chunks” which you can toss into any recipe to add nutrients. Check out Rain Country on You Tube. Heidi is an expert at this and dries every kind of leaves. She is very much into nutrition and herb growing, so she ends up the summer with many different leaves dried (and flowers) and creates a mix of dried leaves that she tosses into just about everything. By the way, swiss chard with the white stems is more cold resistant than the Ausie colored chard. Mine holds up all winter under plastic. Might not in Vermont, but will definitely last longer in the fall than the rainbow chard. Basil: It’s been my experience that basil and other herbs do best with partial or dappled shade. I have learned to plant all my herbs in an area where there is a tree growing to keep them shaded (for the most part) in the heat of the afternoon sun. They don’t seem to do well in the Pacific Northwest in full sun as this climate doesn’t get too hot normally. My basil does better there than in the veg rows. OMW! I laughed out loud over the mental anguish of your cilantro! I do like how your mind works! We have been using a flame weeder for years! it was my husbands fathers day gift about 15 years ago and we have gifted a propane weed flamer to both sets of parents who equally love theirs. Helps keep the weeds down in our gravel parking out front instead of round up like all the neighbors use. WE have so many quail in our yard, I like to think its because our little ecosystem here is healthier for not using pesticides. Our son, now 19, used to love watching dad use the flame belcher, and now it is his chore! You garden looks great! Thanks for the glimpse into your life, and the smile your cilantro ode wrought. Glad to hear you’ve had good luck with the flame weeder! It’s our first year using it, but we’re pretty happy with it so far. 😆🤣”BetaTest” with a toddler!😂🤣 Here in The heart of America the scorching heat ensued a full 6 weeks earlier than normal and accompanied by a drought, close on the heels of an unusually late and cold/nearly nonexistent spring. 101 degrees in July + tender young plants equals unproductive garden. The only thing I have left is some very wimpy basil. Maybe next year. 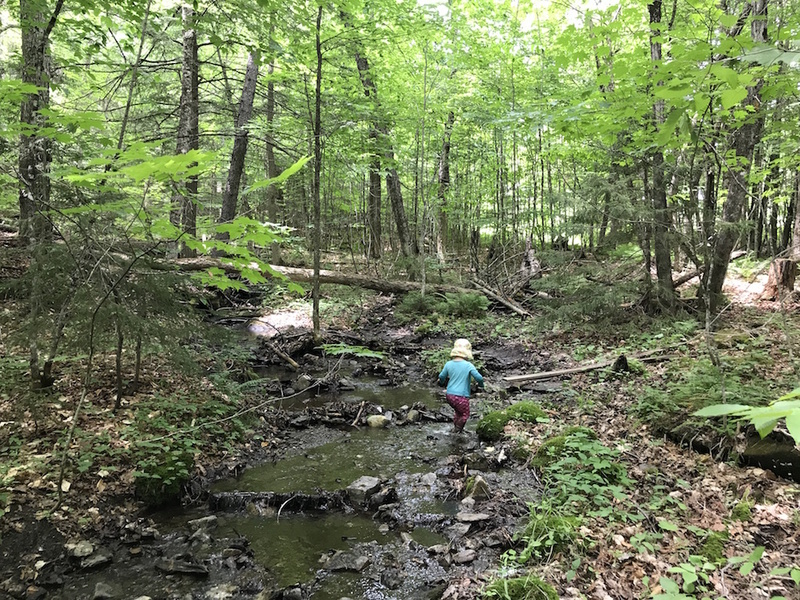 Always interesting to hear what you guys are up to…I loved the creek picture with Babywoods…I predict she will have many fond memories of that place! I would love to have recipes for some of the meals you make with all the garden goodies. So jealous. My gardening attempts are failing, although it’s probably largely due to the fact that we’re gone for 5 weeks, leaving the baby plants to fend for themselves. Have fun with flame throwing! Gardening is hit or miss from year to year. One year we have a bumper crop of tomatoes and the next year not so much. This year my Yellow Squash is coming in like crazy. Our Kentucky wonder beans are also going crazy but they are just too tough for me. Next year I am going to try Emerite beans which are supposed to be more tender. We have cut way back on gardening and give the funds to our local farmers market. It is hard work being a farmer! Please update us with new garden photos! Our big tomatoes don’t seem to want to get ripe here either, though we are getting cherry tomatoes. I had some of the tomatoes on crackers with tuna salad for lunch. I’m so glad you’re still writing (since I fully remember and appreciate how exhausting the early-mom years were: all sympathy & solidarity). This post was hilarious! No worries about the delay : ) I thoroughly enjoyed it, and feel privileged to get the chance to read your work, even during this busy season in your life. Thank you for sharing your writing with us. 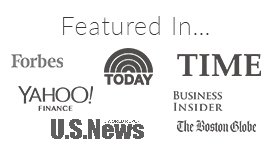 Thank you for the July savings seminar! Taught this old girl some new ideas. Want to suggest an austraulian newsletter for your great garden. OUR PERMACULTURE LIFE, By Morag Gamble. Great! sounds like you have been super busy With your veggies. It is just so rewarding! With pumpkins the harder the flesh generally the better the taste. Not sure if the pumpkin Aussie Blue will grow there but fabulous flavor and also Butternut. It is also the way you cook pumpkin. Roasting is best as it condenses the flavor. Basil is a warm climate herb and even more so Thai bail. It really needs a super warm and humid climate. We freeze all our excess cilantro including the roots as they are often used in curry pastes. As soon as the flower head starts appearing harvest quickly as the turn to seed before you can blink. So interesting to see what you grow compared to us oin sunny Brisbane,! Shortly after you first posted about the flame thrower, err… flame weeder, I was offered the loan of one. OMG – so much fun and such a quick way to kill the weeds. They do come back, but it sure is effective at getting thee unwanted above-the-ground greenery. And FUN! Did I mention torching my yard was FUN! Lastly, since I’m trying to kill off what’s left of my lawn, burning it is easier than mowing (especially since I sold the lawn mower a couple of months ago). Can’t wait for the “things to do with chard” post that surely must be coming. I can’t take many plants with me on the road, but I did bring mint this year and boy is it happy to live in a pot in 4 different states. Who knew mint had such a gypsy soul? And you know what you can do with mint, right? Mojitos! All the mojitos! Haha. MOJITOS! You’re speaking my language. Bring your mint with you when you come visit and we’ll mix some up. I think the correct technical term for a mini-orchard is ‘orchardette’. Try growing basil and parsley in pots on the porch. (It could be a Babywoods Project.) The 2 plants seem to like being side by side-although not in each other’s faces-and I have found that basil grows best in a large pot. I like my green beans canned with a lot of salt. But try browning some cooked fresh with olive oil, a little basil, sea salt, and some fresh mushrooms. Just the best! Now really! Who does not LOVE kale? I eat that in salads, frittata, soups, and anything else I can think of. Try adding some other fruit trees to your orchard, like apricot, nectarine, or fig. Maybe you just need a little more variety to keep bugs confused. I am very impressed with what you folks have done in such a short time. And good on you for getting Babywoods interested in vegetables and fruits. I see too many parents with toddlers in the grocery market that are screaming, “No! I won’t eat that!”. So sad when so much variety is good for the soul and the body. Not sure if blue lake green bean variety will grow in your zone but they have a much better flavor than other green beans in my opinion. Best wishes! The flame weeder certainly is a multipurpose tool that many people overlook. I use mine mainly in winter to carefully clear sidewalks of ice. It used to get more use in my garden, but for the last 20 or so years I never weed and seldom water. I bag my grass clippings and use them for mulch. At one time I used shredded newspaper (no color anything), but it only degrades good in compost. Since switching to grass clippings I seldom have weeds. Wow, this is so cool! Just this year I got my hands on a small gardening plot (5ft x 5ft) – super excited to get on the gardening train! 2. Do you log/calculate how much time you spen i n the garden doing various tasks? I’m still working a 9-5, so I’m curious how to fit this in (at a smaller scale) to my day-to-day life! Hi, Kate! The answer to #1 will depend largely on what growing zone you’re in and what will grow best there for you. Ask your local friends/neighbors who are gardeners or check out your local extension school for info on what’s best in your zone. We do not log how much time we spend in the garden, but I can tell you that it’s A LOT!!! That being said, our garden is pretty large and with a smaller plot you’d certainly spend less time. You could always start with just a few plants and see how it goes. I know there are lots of great bloggers and YouTubers who write about how to best maximize a small gardening space. Good luck and enjoy :)!! Mulch, mulch and more mulch! Where is the mulch in your garden? Any chance Mr. FW would share the pickling recipes? I rejoined my CSA this year and am trying some new recipes, but any that are tried and true will be much appreciated. I agree with AS on the blue lake beans. They are the best and have grown every place I have lived. They should do just fine in Vermont as this variety has been popular for many, many years and almost all the catalogs carry them. . They come in two flavors; bush beans witch produce sooner then quit and pole beans which come in a little later but will keep producing until frozen out. If you can them I found out early on that the Ball canning books recommend too much salt and I have since reduced the amount to a couple of pinches. The added salt is just for flavor, it is not needed for the canning process. We need to try that Surround product on our 2 year old chestnut trees. The Japanese beetles unfortunately love them and my husband applied insecticide this June which works but it burned some of the top leaves :(. Love reading your homestead life articles, thanks for writing! Hello, is the surround you put on your fruit trees the product from gardens alive? I’ve been wondering about that product. Thanks. I gave up on my garden this year because of the horrible weed situation we faced. But I’m intrigued by the Flame Weeding… Sounds like something I may have to try next year! Thanks for the recommendation. Good luck! At the very least, it’s fun to wield a flame torch :)! THE FLAME WEEDER! SO AWESOME!! Thanks for writing about it! So cool!! Glad you liked it! I had you in mind when I wrote it ;)! I’m surprised you have not discovered the wonders of planting more root veggies, especially potatoes which are easy peasy, and keep well over the cold winter months. you can buy a bag of the variety you’d like, let them eye out, cut them up and each eye becomes a big plant. We’ve considered root veggies, but at present, we’re able to buy large, organic quantities of these for very cheap from our grocery store or farmer’s market. And so, we’ve decided not to grow them right now. But, perhaps in the future! I have a little tomato thief too :-). I don’t think my husband or I have had a single cherry tomato from the garden this year. She will eat them in varying degrees of ripeness – she loves them all. Planting more next year! Could you share your pickle recipe. We tried one last year that I didn’t like very much and I wanted to find a different recipe to try this year. Please tell me the link to your story about why you chose that homestead. Thanks. Your homestead looks so peaceful. If I could book a room for our family I know where I’d like to spend my next 7-day vacation! Ok, let me start by saying I absolutely need (and I would have put that word in italics had I had the option) one of those fire weeders. Need it. Perhaps my garden consists solely of a 4×8 raised bed, but still. Also, I live in western Massachusetts, which is a fairly similar climatize to yours, and the basil (regular, not Thai) has proliferated ridiculously, to the point of me not wanting to eat any ever again (gasp!). Our cilantro has performed similarly, although I don’t think I could ever tire of it’s incredible freshness and flavor punch. Cowboy Caviar, anyone? To get rid of worms you might want to try boiling rhubarb leafs (which are toxic for humans to eat), let cool down, transfer the liquid into a spray bottle and spray on the areas affected by worms. This is what we do, since we don’t want to use chemicals in our garden.